1000's OF BALLOONS FOR ALL OCCASSIONS ! 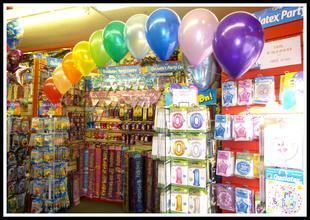 'Party Balloons' offer on extensive selection of foil & latex balloons, helium or air filled in our Bishops Cleeve Shop. Come & discuss your individual needs with Jackie or Maxine, who will be happy to assist you. Large selection of balloons & accessories to suit all budgets. From cheap birthday foils to unique designs personalised just for you. Gift arrangements & decor to brighten up any party.